English historians, particularly those of the Whig bent, have often portrayed Tudor England as a Golden Age. The centuries-long medieval wars between barons and kings, barons and barons and kings and kings were over, at least for now. Having lost the Hundred Years War, with some minor exceptions, England’s yeoman archers were no longer being dragged to France to fight and die trying to put an English king on the French throne, and England’s French royalty and nobility were finally starting to view themselves as English. England was taking its first tentative steps to greatness. To put it mildly all this is bunk when seen from the perspective of the majority of the people of England. Among many other repressive measures the Tudor monarchy also brought back slavery. 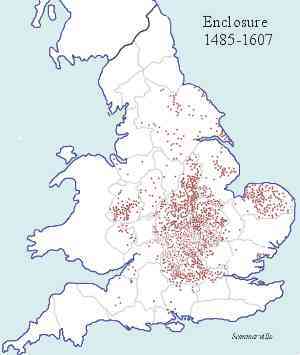 Following the Norman conquest of England, the English were subjugated and dispossessed of their land. Many English thanes and nobles fled abroad (see here for one example). But the vast bulk of the population didn’t have this choice and were reduced to serfdom. Slavery was abolished, in the sense that English people were no longer actually owned by the lords, although it can certainly be argued that the differences between slavery and serfdom were slight. Be that as it may. Yet over a period of nearly 500 years following the Conquest, the English, as opposed to their French overlords, did somehow manage to keep some consciousness of their ‘inalienable right’ to be free. With Norman castles and armed French thugs all around them, they couldn’t do much to reverse their servitude, but they did try. The Peasants Revolt of 1381 and Jack Cade’s Rebellion of 1450 were just two of the more famous but ultimately fruitless attempts to do so. Throughout this time the English people were forced to give up most of their surplus (and some) to the Norman French kings and barons. The extracted money helped them fight their countless wars with each other and overseas; wars into which generations of ordinary people were also conscripted. Yet for all this most Englishmen and women were at least able to farm a little land and raise their families, the price of which was rent plus countless other feudal services due to their lords. Of course this was when they weren’t being decimated by famine, plague and rapacious armed knights. They dreamt of a ‘commonwealth’, they dreamt of being free of the Norman yoke, but they never had the power to achieve any of this. And so we arrive at the Tudors. The fifteenth century Wars of the Roses were a series of fights between various baronial factions for the Crown. Eventually after a bloody game of royal musical chairs: Henry VI, Edward IV and Richard III (not to forget the brief Edward V), and much material for Shakespeare, Henry Tudor gained the throne as Henry VII. The ‘Golden Age’ had arrived. Actually among the interminable list of brutal and stupid kings of England over the last thousand years, Henry VII was one of the better ones. In his 24 year reign (1485-1509) he avoided wars, improved the house-keeping of government and at his death was able to bequeath his son Henry a huge royal fortune. Such kings are however not usually the stuff of national myth and good story-telling. Shakespeare wrote plays about almost all of Henry’s predecessors of the last hundred years and about his megalomaniac tyrant son Henry VIII, but nothing about Henry VII, a trend that continues with television drama to this day. Henry VIII was, as I guess we all know, a tyrant and a megalomaniac and probably a misogynist to boot. When he wanted to be rid of his first wife Katherine of Aragon and marry plain Ann Boleyn, the Pope wouldn’t give him a divorce. So Henry broke with Rome, divorced Katherine and married Ann. This didn’t make him a Protestant; Henry remained a Catholic in all other respects than adherence to Rome until his dying day. Having taken this step and needing more money, as all monarchs always do, Henry’s eye fell on the wealth of the Church in England. The Church and all its abbeys and monasteries still owned about a third of the whole land and wealth of the country. Henry set about stealing it. He started to dissolve (and demolish) the monasteries, cart away their movable wealth and seize their land. Much of the land he then sold on at knock-down prices to his favourite nobles and supporters. The vast majority of English people remained deeply attached to the Catholic Church despite its long role in their own subjugation. Discontent and protest followed. Henry put these down with the usual royal brutality; the most famous (but not only) example being the Pilgrimage of Grace in 1536 (see here). A new conception of the ownership of land was rising by which it came to be looked upon, quite in contrast with the feudal or communal notion of the Middle Ages, as subject to the same completeness of control and use as any kind of personal property. Land was regarded not as a source of wealth but as a source of men… and it was more important for the lord to have men to defend him than for him to increase his wealth by extracting as much rent as he could from his tenants. One at Crosby Ravensworth for pleasure, where he had a park full of deer; one at Yanwath for comfort and warmth, wherein to reside in winter; and one at Threlkeld, well stocked with tenants, to go with him to the wars. But now landlords could make more money turning peasant cultivated land into pasture for their sheep and so they didn’t need all their peasant ‘stock’. How to get rid of them? The strategy was twofold: First, they racked up rents to extortionate levels that both peasant farmers and even yeoman could not afford. Second, by enclosing the fields and commons with hedges and fences and by enforcing brutal penalties against any who wanted to continue to exercise their common rights. The new view naturally prevailed. There was no power strong enough to withstand the landlords (always the real rulers of an agricultural nation), when, in pursuit of wealth, they got rid of the people from the land and proceeded to bring in more and more sheep. Engrossing and enclosing land weren’t new things in England; they went back to at least the thirteenth century. But Henry’s dissolution of the monasteries and subsequent land redistribution did give the process a massive boost. During the period, which may be roughly defined as from 1450 to 1550, enclosure meant to a large extent the actual dispossession of the tenants by their manorial lords. This took place either in the form of the violent ousting of the sitting tenant, or of a refusal on the death of one tenant to admit the son, who in earlier centuries would have been treated as his natural successor. Proofs abound. W. J. Ashley, Economic History. The landlords’ strategy worked. All over England hundreds of thousands of poor English farmers and husbandmen were evicted from the land their ancestors had cultivated for centuries. The landlords then demolished their houses and cottages. The upshot was that many of these evicted people became ‘unemployed’, a word that was used at the time. Another frequent name for them was ‘vagabonds’. Countless thousands could no longer support themselves or their families through the sweat of their own brow. They squatted where they could; they roamed the villages and towns of England looking for work or begging for charity; they migrated to the squalor of London; and, when they were desperate, they resorted to petty theft to survive. This was all too much for the king, the nobles and the landlords. There was, they said, an ‘unemployed’ or ‘vagabond’ problem. The response was that these unemployed vagabonds needed to be punished and, if they continued to be a problem, they were to be killed. Eventually when even these draconic measures didn’t work the government of Henry’s young son King Edward VI resorted to the reintroduction of slavery in England. Parliament in Henry VIII’s reign brought in the lash and the gallows to solve the “unemployed problem” Punishment seemed the right thing for people, homeless and landless, for peasants dispossessed of holdings, for soldiers broken in the French Wars. In 1531 an Act of Parliament allowed licences for begging to be granted to the impotent, and ordered a whipping for all other mendicants. Five years later, in the year of the suppression of the lesser monasteries, Parliament, finding the unemployed still alive, decided to deal more radically with the problem. So on the first conviction of unemployment all vagrants, men, and women alike, were to be whipped; for the second offence they were to be mutilated; and on the third conviction they were to be hanged as felons. This Act of 1536 was rigidly enforced and thousands of unemployed men and women suffered the full penalty of the law. And still the “unemployed problem” remained unsolved, so that it was said that only by sterner measures and greater severity could the question be settled. Therefore, in 1547, the first year of Edward VI., an Act was passed selling the unemployed into slavery. For a first conviction branding and two years of slavery was ordered for the unemployed vagrant; the “slave” was to be beaten and chained by his master, and for running away he was to be further branded and adjudged a “slave” for ever. Death as a felon was the penalty for a third conviction. Let us be quite clear what was happening here. Under the 1547 Vagrancy Act introduced by the Protector of England, the Duke of Somerset, not only would the unemployed by branded with a V on their foreheads, but they would be made a slave for two years – for a first offence. The words slave and slavery were repeatedly used in the Act. If they continued to be unemployed they could be enslaved forever. Slavery recognised by the law had been reintroduced to England. Wasn’t the Tudor period such a Golden Age? Of course all this doesn’t make as good television as King Henry jumping in an out of the beds of his numerous wives and mistresses, so we never hear about it. Another reason for this lack of knowledge is that the 1547 ‘slavery’ Act was soon repealed. Not only were common people appalled by the reappearance of slavery in England ‘the land of the free’, but many in positions of power were too, or at least they saw it wasn’t working. Even this measure, drastic as it was, failed to rid the country of the unemployed. Moreover, people were found in that first year of Edward VI. to dislike the enslavement of free-born men and women. Government it seemed had got rid of papal authority only to bring back slavery to England. So in 1549 the Act of 1547 was repealed, and the (still brutal) Act of 1531 was once more the law of the land. Yet all the engrossing, enclosing and evicting went on. Protests and sometimes rebellions broke out in different parts of the country. The most famous was Kett’s Rebellion in Norfolk in 1549. I won’t tell this story here; the rather anodyne Wikipedia page will give you some idea. But Norfolk landowner Robert Kett would surely be on my list of Top Ten Englishmen. The pride of great men is now intolerable, but our condition miserable. We desire liberty, and an indifferent (or equal) use of all things. This will we have. Otherwise these tumults and our lives shall only be ended together. In these plain and downright phrases the Norfolk peasants flung out their banner of revolt, and called their neighbours to the fray. Nor did they call in vain. Kett moved his camp to Eaton Wood hard by and hither came crowds of poor men on l0th July, while word of the rising was spread throughout the county. For good or for evil, for victory or defeat, for loss or gain, the countryside was rising against the enclosures, and no man could foretell the issue. Of course we can guess the ‘issue’. 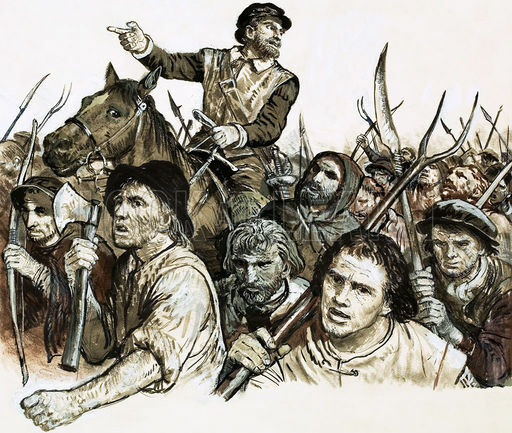 During Kett’s Rebellion several thousand English people were killed by an army of (mostly foreign) mercenaries sent by the young king’s ministers to crush them. Many more were hanged in revenge afterwards, including Robert Kett himself who was hanged from the walls of Norwich Castle on the 7th December 1549. This is fascinating, much of which is known but much of the detail is new to me. It gives an interesting angle on poverty, enclosure, and making the poor even poorer. And all this centuries before Speenhamland and outdoor relief. Thanks Jim for taking the time to read some of my little pieces. Of course most of this ‘is known’ only to such well read people as you. PS Where are your Research Notes? They are private as I have saved them, immediately after your last re-blogged post there on Satish Kumar. I think WordPress plan to re-publish them with ads, as they see it as revenue-potential, though I suspect only after I am inactive. Same goes for ordoliberalism blog and critical social problems. Hi Stephen just came across your post about the Kett rebellion. I really enjoyed it and you really gave me a great introduction to a topic from an angle all too rare. From the ground up! Have you stopped writing you’re blog now? BTW I even listened to a Santana track on your home page -wonderful also. Good on ya.